In 2008, Peter Bernhard founded the Opera Schenkenberg, which he leaded to three big successes that got international attention and excellent reviews: Carmen in 2010, Il Trovatore in 2013 and Rigoletto in 2016. Due to the very slim personnel situation, that was caused by the construction of the festival, Peter Bernhard took care of various fields of the management himself such as artistic direction, sponsoring, marketing as well as hospitality. His technical understanding and his capacity of imagination let him cooperate very closely with the stage designer. 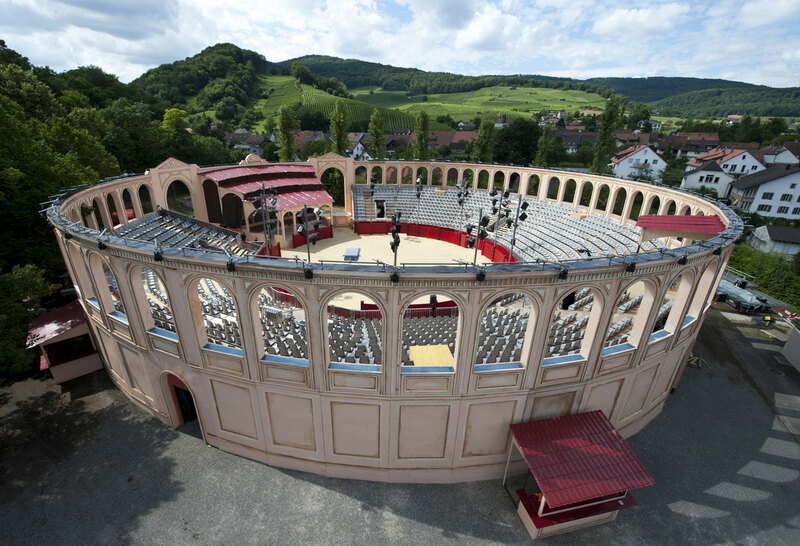 A lot of good contacts in the artistic scene as well as his big network in economy and politics helped the Opera Schenkenberg to the proud number of 3.5 million Swiss francs of sponsoring money as well as just one million francs in state subsidies for the altogether three productions of the festival. more than 15‘000 spectators could be won in ten performances. And this in a village with just two thousand inhabitants in the Swiss central country. For that a bullfight arena was established as a background with a diameter of fifty meters. This fantastic building took just 1‘600 guests and was constructed so perfectly that some spectator asked themselves secretly when actually the Romans would have probably built this arena in the antiquity. The whole festival ground was decorated with cypresses, olive-trees and oleanders. A tavern specially created for it lured more than 600 guests per evening under the snug roof of the lime-trees’ leaves with openly prepared Paella. In a word, one imagined himself for six hours somewhere in deep Spain on holiday. This delight of the guest, this „hijack in another world“ should become the trademark of the Opera Schenkenberg in future. 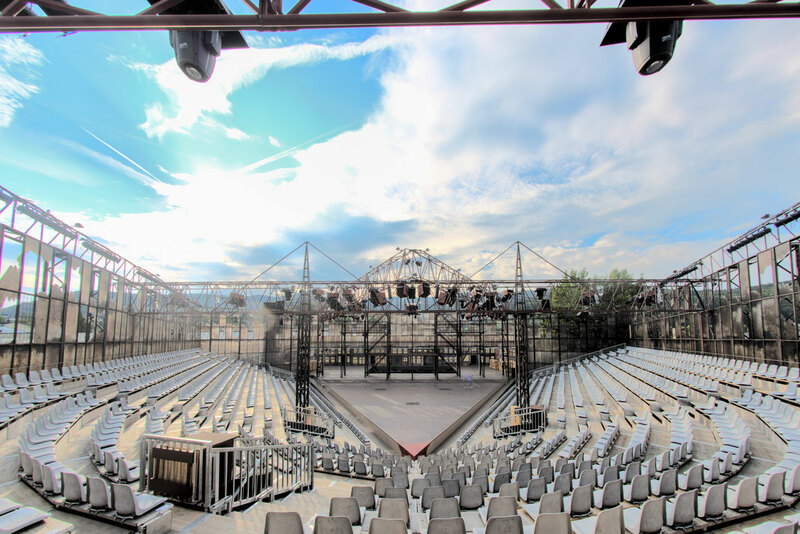 From then on, all the organisators surrounding artistic director Peter Bernhard made efforts to find festival grounds that were spectacular but also almost unimaginable to be able to present an attraction to the spectator and opera lover. The innovation for the location and the skilful linkage of resident and possessing enterprises procured to the artistic team a success that reflected in renowned both national and international reviews. Of course the quality of the production also had to have a high level, because the Opera Schenkenberg certainly understood itself as „people‘s opera“, however, wanted to create clearly the splits between first-time spectators, festival lovers and opera lovers. Therefore, the artistic signature had to equivalently radiate quality and musical refinement. Somehow a village square is predestined to host events of every kind, whether it is an industrial show, a circus or an open-air opera. Such a place is certainly also empirically important for a debut in the festival activity field to minimize various risks from the start. However, festival grounds which do not present themselves right away are far more delightful and have much more potential for surprise and inspiration also for the spectators. The necessary vision of the artistic realisation and therefore the narrative of the story, the musical work are, nevertheless, an indispensable guideline. Elementarily important and the presupposition is absolutely the accessibility of the location such as current and water connection, traffic and construction supply. With the production of Giuseppe Verdi’s masterpiece „Il Trovatore“ the Opera Schenkenberg entered the new territory mentioned above. To organise an opera on the car park of a garden centre with inclusion of the orangeries and glasshouses was probably unique in this form. The architecture of the glasshouses was taken over into the scenery and a gigantic «V» for Verdi’s 200-year birthday anniversary was integrated into the stage as well as into the cover. The customers of the garden centre speculated whether there was probably being constructed a Massaola hall for tropical plants, similarly to the one of the Zurich zoo. More than 60‘000 spectators in twelve performances were present at this artistically outstanding production. Now the international attention was definitely raised, with directors, conductors, managers, agencies and also with singers. For a festival of this size the physical closeness of the spectators to the events on stage was absolutely impressive and enabled them to participate directly in the story and to observe the emotional facial expressions of the singers, thus turning it into an unforgettable experience. Especially for those opera guests who ventured for the first time on this art form and who showed rather big fears of physical contact to the music theatre this ability to almost grab one of the protagonists meant a unique experience. The demands for the actors and the directors are accordingly high on such festival grounds, because one is exposed very much and to be seen approximately from every angle by the spectators. However, just there lies the big motivation and the fantastic challenge that doesn’t apply in this form to the usual „peep-show box stages“. The high artistic quality of both first productions had quickly spread internationally. Celebrated agencies throughout Europe contacted consequently the management of the Oper Schenkenberg. Finally, for the third production of Giuseppe Verdi’s «Rigoletto» a very illustrious ensemble could be obliged. Outstanding artists who have pursued their careers at the Metropolitan in New York, at the Scala di Milano or at the Opernhaus Zurich. With the probably very controversial, but admittedly skilled and artistically gifted director Giancarlo del Monaco the management team engaged a big master of his field. The stage setting was at the highest level and the story incredibly authentic and enacted in a way that “got under the skin”. It was also his merit that the non-professionals in the choir as well as the extras for the court society almost surpassed themselves and formed an approximately homogeneous and weighed-out team on stage. This is worth mentioning, because it was always extremely important to the director to integrate the population of the region not only behind the backgrounds, but as well actually on stage to give an identity to the festival. He didn’t avoid the expenditure to allow musical teaching to the choir during one and a half years on a weekly basis and thus to bring them to a professional level or to recruit a team of over 200 volunteers who did all the necessary work backstage from tailoring costumes to managing the admittance or helping in gastronomy! The summer of 2016 was a very problematic one for a lot of open-air productions. The continuous rain until June and the enormous variety of productions and events that had grown in the meantime pushed one or the other organiser in bad difficulties. This was also the case for the Opera Schenkenberg. Despite the best reviews possible, the comments on the news show of Swiss television, the wide announcements on social media, the recommendation on an enormous amount of posters in German-speaking Switzerland, the lack of over 50% of the spectators hit the festival so hard that the management had to quit all festival activities. Very much to the regret of a lot of opera lovers. As a result, one must probably reflect the whole festival culture and consider at most drastic innovations, since even venues rich in tradition and very recognized since decades communicated big problems.